There are many ways to mount a triple vertical glove box dispenser, you can attach the glove dispenser/holder to wood, steel or cement walls. A good place to mount your triple vertical glove dispenser is somewhere close to the person who uses gloves. Many businesses use this particular triple glove holder because it is made so the glove boxes inside lay in a vertical format. 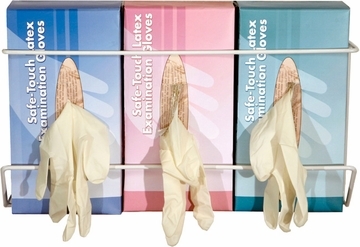 This way of arranging the latex, nitrile or vinyl glove boxes allows the user to read the size and style of the glove easily before donning.